Topic: Free Webinar on "Action Based Scrum"
Free Webinar on "Action Based Scrum"
Topic: All a PM wants to know about Contracts !! All a PM wants to know about Contracts !! Topic: Webinar on " Distributed Scrum Team "
Webinar on " Distributed Scrum Team "
Topic: "4 Days PMP Training by iZenBridge in Vadodara,Gujarat"
"4 Days PMP Training by iZenBridge in Vadodara,Gujarat"
Date : 21,22,28,29 March 2015. Time : 9.30 am to 5.30 pm. Venue : Alkapuri , Vadodara. 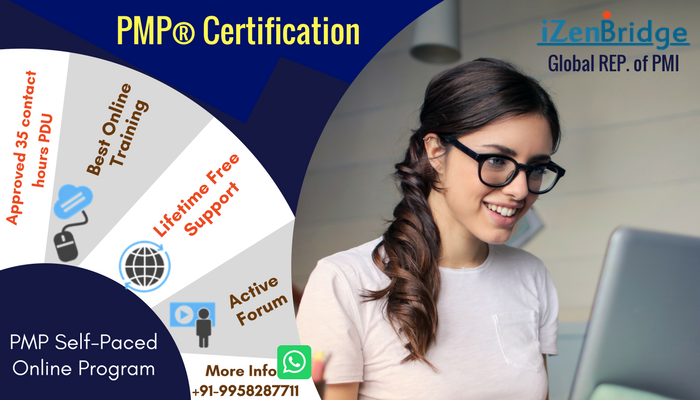 Topic: "PMP Classroom Training in Pune by iZenBridge"
"PMP Classroom Training in Pune by iZenBridge"
iZenBridge 4 Days classroom training in Pune, starting on 16 May, 2015!! Date : 16,17,23,24 May 2015. Time : 9.30 am to 5.30 pm. Venue : The Centurion Hotel, Shivaji Nagar, Pune 411005. Visit on http://www.izenbridge.com/events/pmp-training-pune/ for details and Registration..
Video of webinar on Team Development (Tuckman ladder model), which was held on 13th December, is now available on our youtube channel. Topic: Webinar on "Team Development (Tuckman ladder Model)"
Webinar on "Team Development (Tuckman ladder Model)"
"You are the project manager and working on the process of Monitor and Control Risks. Which of the following is NOT Tools and Techniques you can use for this process?"